The legendary events and personal tragedies that marked the life of Mary, Queen of Scots will be the subject of a new exhibition in Edinburgh this autumn. Linger Awhile, which will open on 14 September at Arusha Gallery, will include 17 new oil paintings by Glasgow-based artist Helen Flockhart, focusing on the human side of the historical figure. Helen Flockhart (b.1963) is one of the finest and most distinctive Scottish artists of her generation. She often draws creative inspiration from esoteric and mythical sources, and her unique style combines intricate patterns, backdrops of lush foliage, and surreal scenes that appear suspended in time. The works in Linger Awhile stem from Flockhart’s fascination with the controversies, legends and divided opinions — even among today’s historians — that surround the figure of Mary, Queen of Scots. The minutely painted scenes and colourful portraits weave myths with historical facts, and feature Mary, recognisable with her auburn-red hair and near six foot-tall stature, as a woman filled with hopes and aspirations. Fittingly, the exhibition will travel to Linlithgow, the birthplace of Mary, from October 2018 to January 2019, after the Edinburgh show. Mary Stuart, often called Mary, Queen of Scots was a controversial figure. Born in 1542 at Linlithgow Palace, Scotland, she spent her childhood in France and married the Dauphin of France, Francis, in 1558. After his death in 1560, she returned to Scotland and married her first cousin, Lord Darnley, with whom she had a son, James I/VI, in 1566. Darnley was assassinated in 1567, and quickly afterwards Mary married the Earl of Bothwell — her alleged lover and assassin of Darnley. Their union was contentious, as many believed the couple was implicated in Darnley’s murder; it was followed by an uprising which led to Mary’s imprisonment at Loch Leven Castle, before she was forced to abdicate in favour of her infant son. She escaped in 1568 and fled to England, seeking the protection of her cousin Queen Elizabeth. However Mary was still considered by many the legitimate sovereign of England and, as a result, a threat for Elizabeth, who kept her in custody in various castles and manor houses for the next 19 years. Elizabeth eventually ordered her beheading in 1587, after Mary was found guilty of plotting to assassinate her. 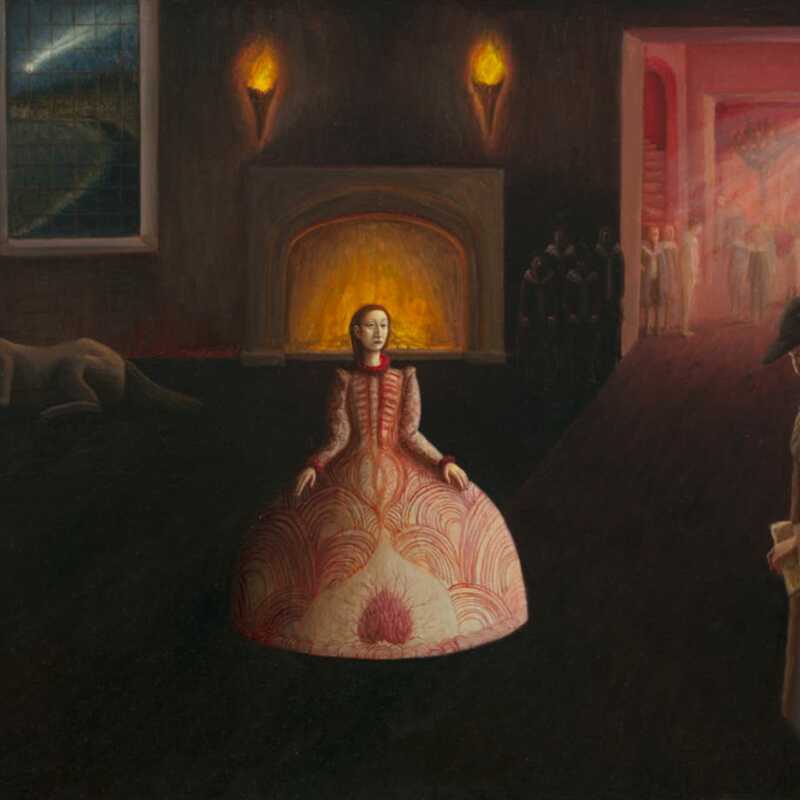 The painting Linger Awhile, after which the exhibition was titled, explores childhood innocence and Mary’s first wedding. She and Francis, only 15 and 14 at the time, are shown curled up in an affectionate embrace, almost engulfed in crumpled bedding and lace from her petticoat. The tender scene evokes a dream-like sense of peace and comfort, while bright tumbled wild flowers recall the abandonment and carelessness of youth. Here Flockhart wonders what Mary, not unlike Faustus giving the devil his soul in exchange for worldly pleasures, would have given to remain in this idyllic stage of life. Intricate patterns of Scottish thistle, French fleur de lys and Tudor rose form the lace of her dress, as if the symbolism of history was an integral part of her outfit, already a nod to the historical events that would ultimately lead to her death. As well as ominous castles, Flockhart often includes lush gardens of alluring strange beauty in her work, with details so intricate they can take several months to be completed. In the portrait Indian Summer she shows Mary in the final autumn of her life, a season described in historical accounts as unseasonably mild and a time when Mary reached a stage of serenity, seemingly not tormented by her imminent death. Flockhart combines symbolic significance and emotional intensity, the ripe fruit and luxuriant vegetation suggesting vibrant life and inner peace. Yet the figure’s yellow and orange dress remains ambiguous: the swirling motifs suggest a sense of internal tumult, and hint at the bonfire from contemporary representations of her death, where her belongings were burnt to prevent supporters keeping them as relics. In Lover’s Eye, the motif on the dress is repeated like a wallpaper pattern: Mary is shown escaping Loch Leven Castle, pushing a bark carrying two small figures — a reference to her miscarrying twins during her time at the castle. As well as using Mary’s dress as a medium for historical references, Flockhart literally weaves the legend of Mary into her own outfit. In Lachrymose Window, Mary’s dress is similarly heavy with narratives: Queen Elizabeth, a banner from the Scottish battle of Carberry Hill, the Scottish minister John Knox as a crow, and a dolphin for Mary’s first husband Francis, are all part of the detailed embroidery. There is also the reproduction of an inflammatory poster used after hers and Bothwell’s marriage, showing a hare and mermaid: the former a hint to his family’s coat of arms, the latter the symbol of a prostitute. Wearing her own legends, the images so jumbled up it is impossible to tell facts from tales, Mary sits patiently by a window covered in thick fern and ivy: a nod to the 19 years she spent incarcerated by Queen Elizabeth.